I’ll be honest. 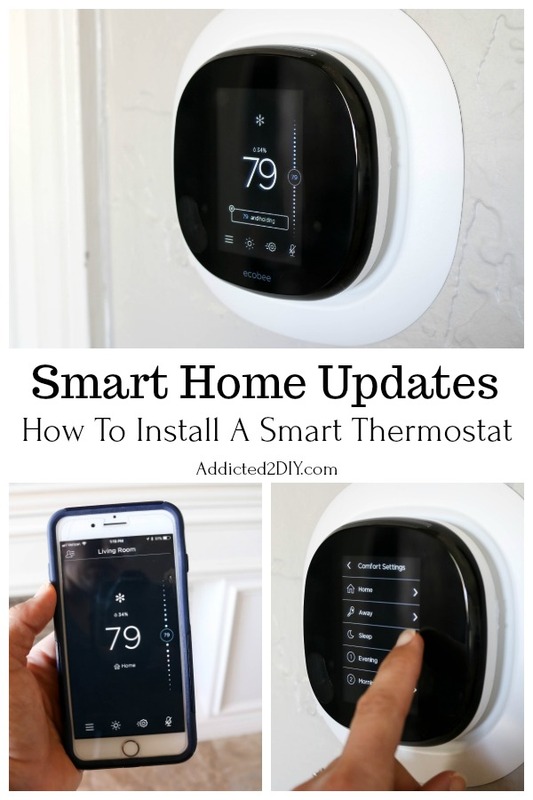 I have always steered clear of even attempting to figure out our thermostats in our home. I could never figure out how to program them. Frankly, all I really cared to know was how to turn them on and off and turn up or turn down the temperature. The rest I left to my husband. That is, until we got this new smart thermostat. Not only was it super easy to install, but I even programmed it without his help! 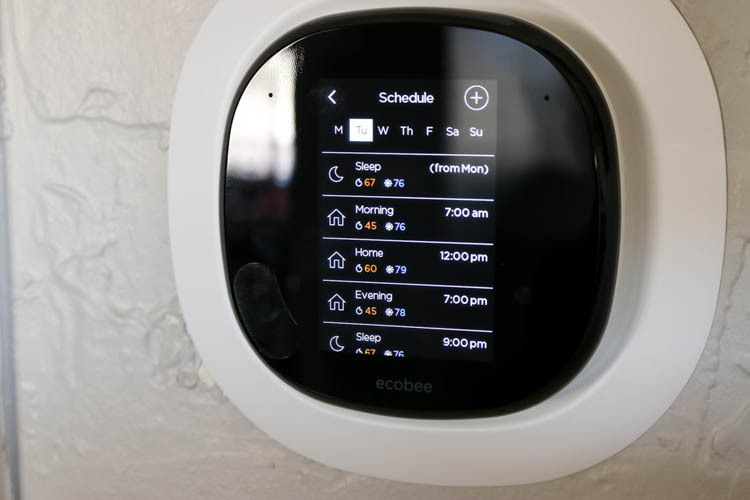 I’m partnering with The Home Depot today to show you all about the EcoBee4 smart thermostat and how easy it is to install it in your own home. 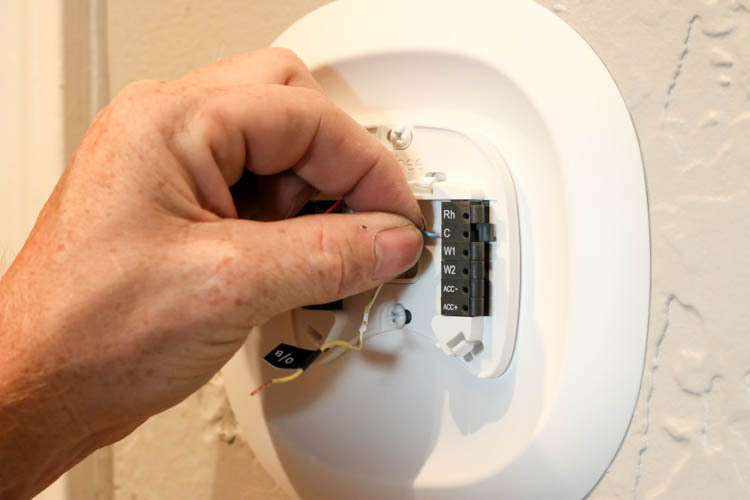 The first thing you’ll obviously want to do is remove your old thermostat. The contents of the EcoBee4 box include stickers to label the wires. As you detach the wires from the old thermostat, you’ll label them with the corresponding sticker. 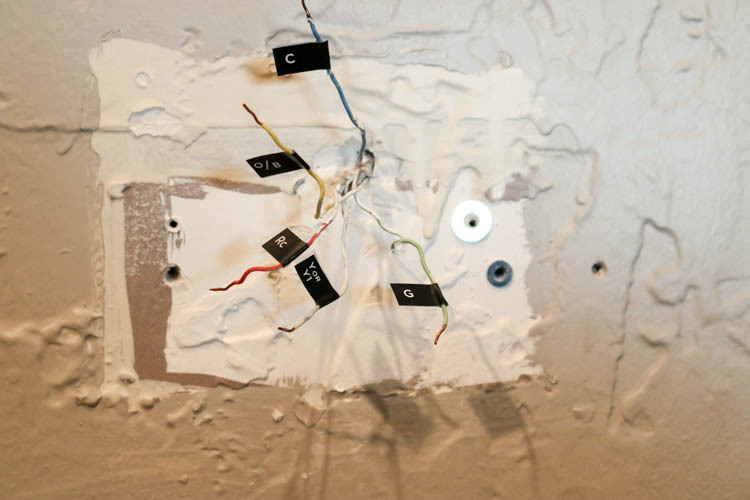 Install the thermostat backing to the wall with the provided screws. I loved that the backing had a level built into it to make sure we didn’t accidentally install it crooked. Next, you’ll just plug the wires into their corresponding ports. Again, the stickers labeling the wires makes this a snap. 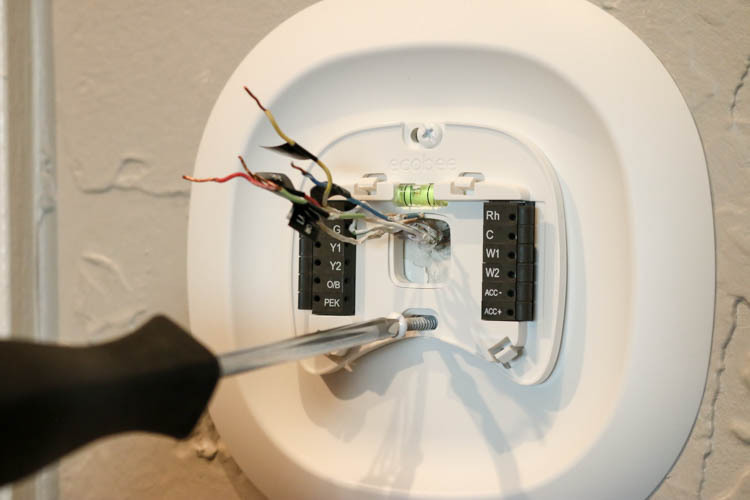 The thermostat plugs right onto the plate and you’re ready to begin the setup process. 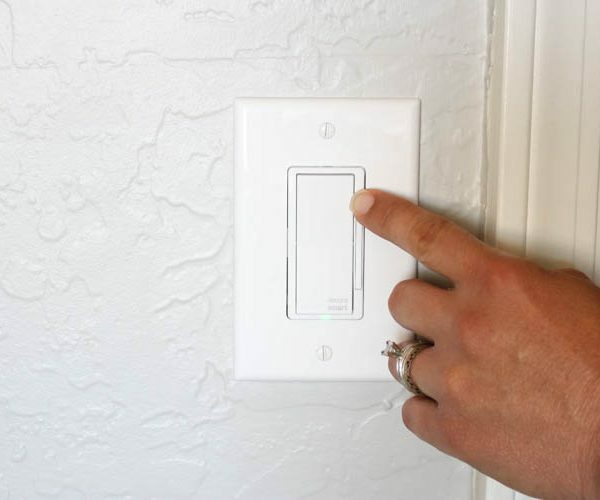 Once it turns on, just follow the prompts to connect it to your home’s WiFi. 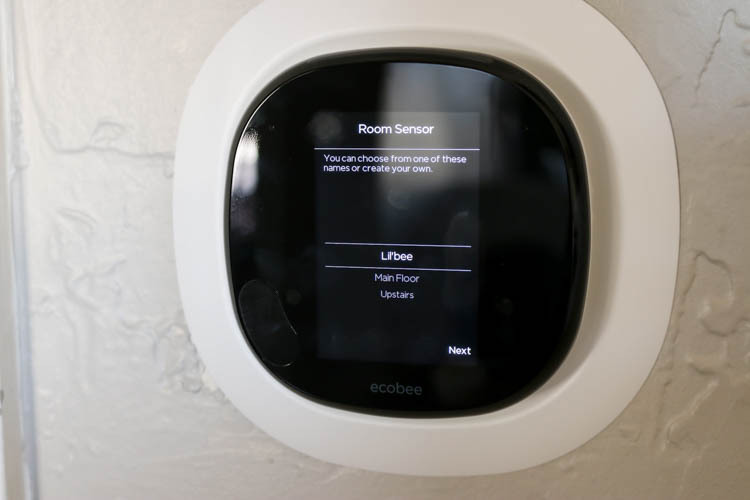 You’ll also want to download the EcoBee app on your smart phone. 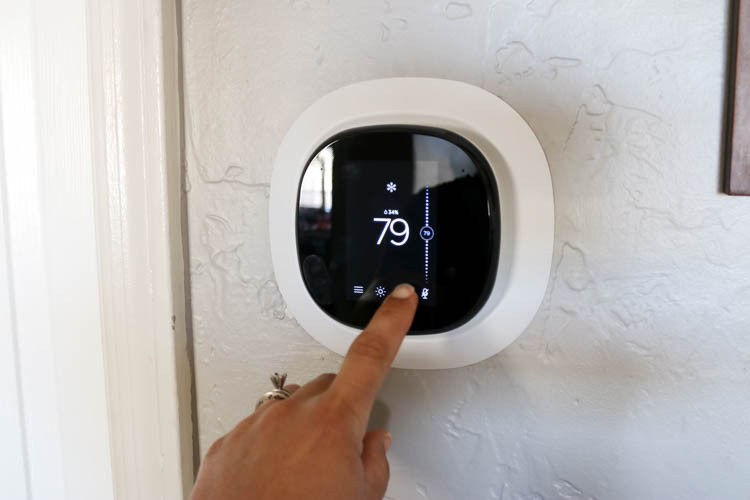 Programming the smart thermostat is so easy to do. Like I said, I always avoided these tasks with our old thermostat, but this was so simple. You can set custom comfort settings that will adjust the thermostat throughout the day based on your preferences. Once you have your comfort settings done, you can program the daily schedule. 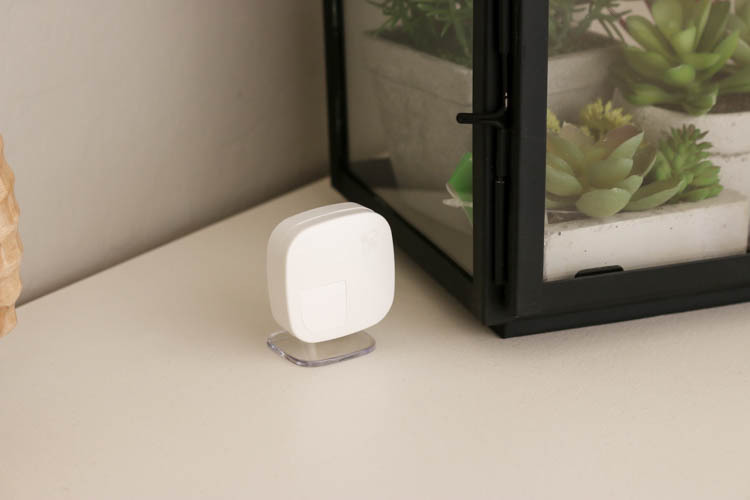 The room temperature is easy to adjust from your phone or from the thermostat itself. 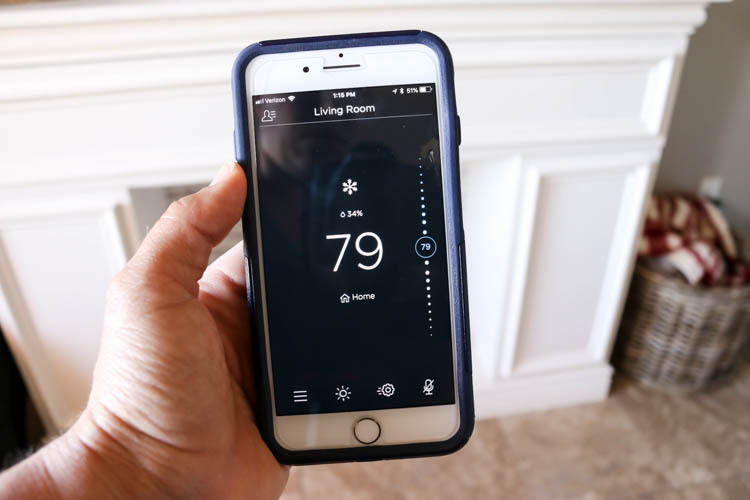 If you turn your thermostat up when you go on vacation, you now have the ability to lower it when you start getting close to home, rather than sweating it out as you try to unpack. Or if it’s a chilly winter morning, you can turn up the heat from the comfort of your bed! 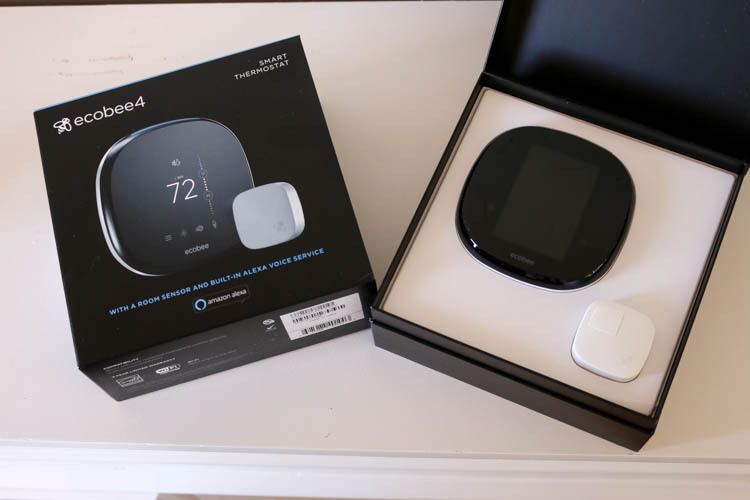 The EcoBee4 smart thermostat also has an included room sensor. 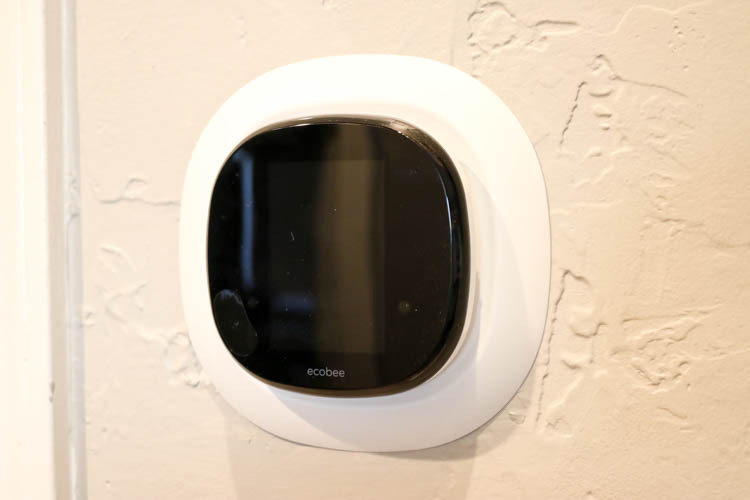 If you have a room that is always warmer or colder than the other rooms in your house, you can place the sensor in that room and your EcoBee thermostat will work to cool or heat that room to the desired temperature on your thermostat. It’s a great option if you have western facing bedrooms like we do. 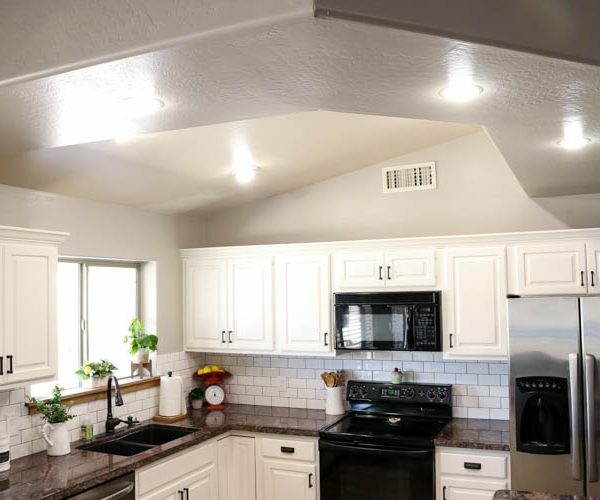 Our boys’ rooms are always a good 10 degrees hotter than any other room in the house, so this will be so handy to keep their bedrooms more comfortable. 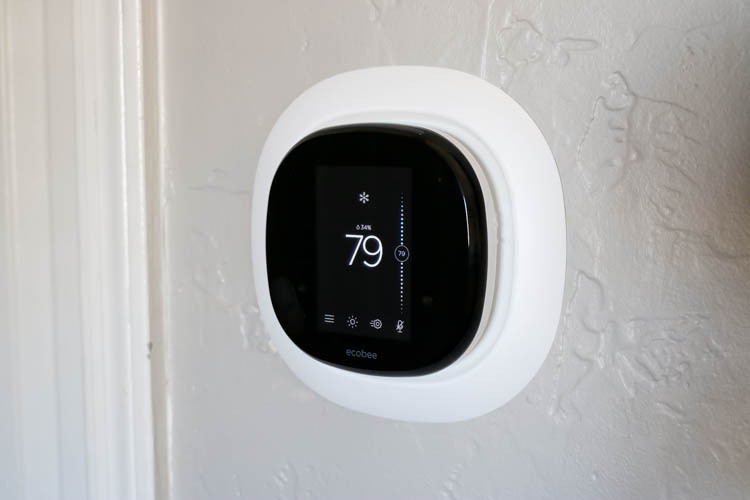 I’m definitely very happy with how easy the whole process was of installing and setting up the EcoBee4 smart thermostat. I love the ease of adjusting the temperature and setting up the schedule. Since we have two air conditioners on our house, we plan to also get another one for the other half of the house as well. We’re on our way to a fully outfitted smart home! 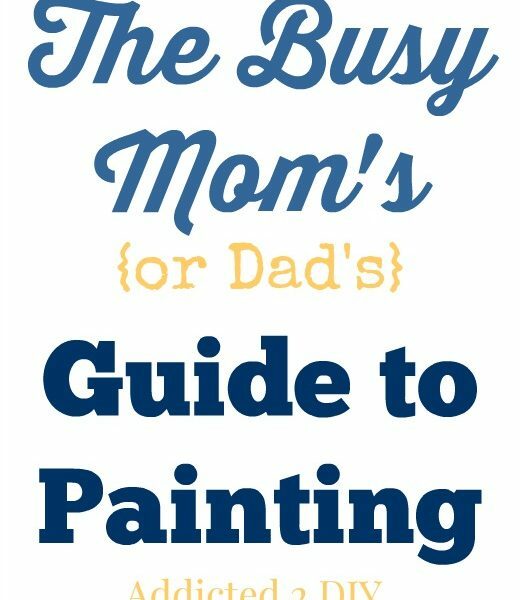 The Busy Mom’s (or Dad’s) Guide to Painting – Plus a Giveaway! 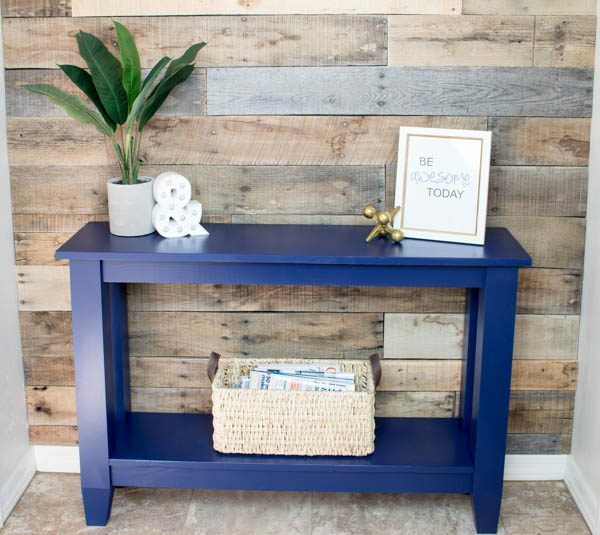 previous article: Knockoff Furniture Projects You Can Build For $100 or Less!